New Hall Lodge Park is the perfect UK base for those wanting to invest abroad and retired couples, or singles, wanting to downsize and enjoy an easier lifestyle. Below are just some of the reasons that owners gave for purchasing a leisure home at New Hall Lodge Park. We moved from the UK to Spain about 7 years ago and bought our dream villa near the coast. However, we realised recently that as we got older, we actually missed our children and grandchildren and even the British weather! It got too hot for us in Spain and as our health was not as good as it used to be, we wanted the security and comfort of living back in the UK. Timothy Hay, the owner of New Hall Lodge Park, flew over to see us in Spain and offered us a very fair deal to exchange our villa for a brand new lodge at New Hall Lodge Park. The part exchange process was straight forward and successful and we are delighted to be owners of our fabulous new lodge on the Park. We would not hesitate to recommend the simple part exchange facility to other people in Spain or the UK. "We have a property in Portugal but it gets too hot there in the summer. We like to return to England at that time and need to keep a base here so we don't impose too much on our family. New Hall gave us the perfect solution. We can now pop back as often as we want to and it's nice to know that our UK home is safe and secure while we're abroad." 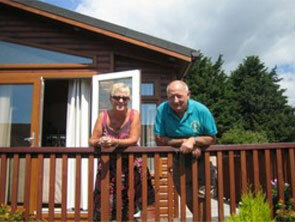 "Since my husband passed away, I had struggled with the upkeep of our large house and garden. Selling up and buying a small flat with no garden plus a lodge at New Hall just lets me relax. Everything is taken care of that I couldn't manage before, as the wardens even cut the grass for me!" "We were rattling around in a big house since the children moved out. It just made sense to sell the house and downsize to something smaller. It also meant that we could purchase a timber lodge at New Hall. We can finally do all the travelling we've been promising ourselves for years and also have lovely holidays in a peaceful village-type community, whenever we like." "I wanted to be closer to my family, having moved away from the area many years ago. The difference in property prices meant that a move back was out of the question until New Hall Lodge Park came along. The prices are very reasonable and I bought a beautiful holiday Lodge near to the family so that I can visit them any time I wish while not being under their feet."